What a delicious night! Was it the flavors wafting that seduced the NYC crowd to leave the city or the dazzling Ferraris? Hosted by Miller Motorcars, the restauranteurs and the diners all gathered for a wonderful evening of camaraderie. Fabulous wines were sipped offered by Putnam Wines and Liquors including an amazing French Chardonay and an Italian Montepulciano. Altaneve had a variety of proseccos chilled on ice. Savory treats including truffle risotto, lobster bisque, and honey drizzled goat cheese bruschetta dotted the room. 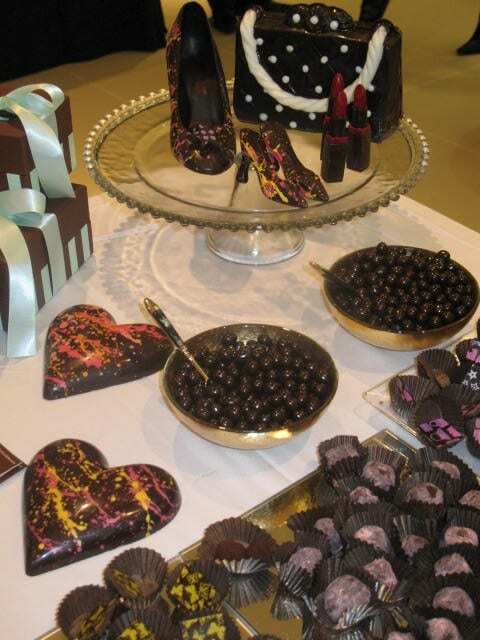 Master chocolatier Diane Holland from Blue Tulip cholates created lipsticks and shoes that would make you do a double take they were so real! Citarella also had a table of sweet treats including devil cakes, chocolate mouse, and mmm mmm good biscotti in Vin Santo. The proceeds benefited the Transportation Association of Greenwich. . (TAG) is a private not-for-profit organization specializing in transportation services for elderly disabled individuals and transportation for the disadvantaged of all ages. Founded in 1984 in response to a critical need identified by the United Way, TAG has served town residents, organizations, and numerous social services agencies in lower Fairfield County for over 30 years. One of its programs, Safe Rides, aims to reduce the dangers of teen drinking and driving. Teens are allowed to use the service to call for a ride in the event that they feel unsafe driving themselves or others home. Cheers to a good cause this fine fall evening.